These two teams have not met yet this season. The final game of Week 6 was arguably the best of the season so far as the San Diego Fleet lost on a last-second field goal to the Birmingham Iron, 32-29. The two teams combined for nearly 700 yards passing, as both quarterbacks threw for three touchdowns and two interceptions in the contest. The loss dropped San Diego to 3-3 on the season. After San Diego got an early field goal, Birmingham responded with two touchdown passes to take a 12-3 lead. San Diego would cut the deficit to three, but Birmingham got nine straight points to extend their lead to 21-9. San Diego quarterback Mike Bercovici then led his team on two impressive touchdown drives, as Terrell Watson scored from 2 yards out before Bercovici completed a 12-yard strike to Watson to put the Fleet on top by two. Birmingham would retake the lead before Bercovici found Francis Owusu for a 13-yard touchdown to tie the score. That set up the dramatic finish as Nick Novak connected on a 44-yard field goal to give Birmingham the victory. Bercovici completed just 50% of his passes for 311 yards and three touchdowns. He also threw two interceptions. Watson had a carries for 38 yards and a score and added two receptions for 17 yards and another touchdown. While Bercovici had an outstanding game on Sunday, he has not put up particularly good numbers this season. The San Diego quarterback has completed 52.9% of his passes for just 791 yards and has thrown five interceptions with just four touchdown passes. Ja’Quan Gardner leads the team with 309 yards and three touchdowns off 61 carries, an impressive 5.1 yards per carry average. Dontez Ford has been the big-play receiver, making 15 receptions for 435 yards, a 29.0 yards per catch average. The defense has recorded 18 sacks this season, led by Damontre Moore who has five. The fleet have also recorded 10 interceptions the season, led by Kameron Kelly who has three. 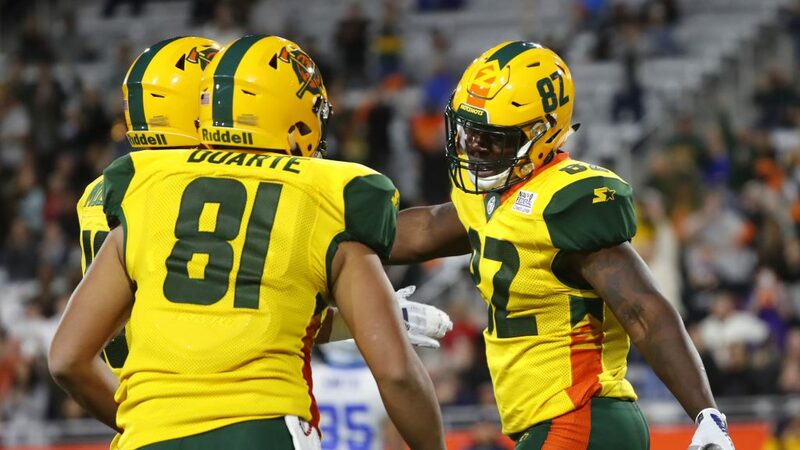 The Arizona Hotshots have been a fourth-quarter team all season, and that helped them to end of their three-game losing streak while also ending the five-game winning streak of the Orlando Apollos as they went on to win 22-17. A 1-yard touchdown run by Jhurell Pressley with a little over five minutes left in the contest proved to be the difference. Orlando led coming out of the first quarter, 6-3, but Arizona would respond with 11 points in the second, including a 9-yard touchdown pass from quarterback John Wolford to Pressley to put the team on top by five heading into the half. A scoreless third quarter gave Orlando the chance to regain the lead with a 17-yard touchdown pass a little over five minutes into the quarter. However, the Hotshots would not let this one get away, as Pressley plunged into the end zone from 1 yard out and the team added a two-point conversion to complete the five-point victory. Wolford had a solid performance, completing 16 of 27 passes for 162 yards and a touchdown. Tim Cook rushed for 71 yards on 11 carries and Pressley had 57 yards and a touchdown on 13 carries. Richard Mullaney was the leading receiver with seven catches for 73 yards. After a quick start to the season, Wolford has struggled of late. He has thrown for 1188 yards and 11 touchdowns, but also has six interceptions. Pressley has rushed for 343 yards and a touchdown on 75 carries to lead the team. Rashad Ross leads the team in receiving with 29 catches for 452 yards and six touchdowns. The defense has been solid but not spectacular, recording 11 sacks and seven total turnovers. Steven Johnson leads the team with two interceptions from the linebacker position. Arizona seems to have righted themselves with a huge victory over Orlando last week. The defense did a solid job but will need to step up bigger in this contest to thwart a San Diego offense coming off of one of its best performances of the season. While both of these quarterbacks will make mistakes and force balls at times, San Diego has proven that they will take advantage of opposing quarterback’s mistakes as well. We take San Diego and the points. This could very well be a game in which team makes the least number of mistakes. The Arizona defense is solid, but the San Diego group is a difference maker. They make plays and give their offense additional possessions. We look for that to help make this a higher scoring affair, as the San Diego Fleet win, 28-21.